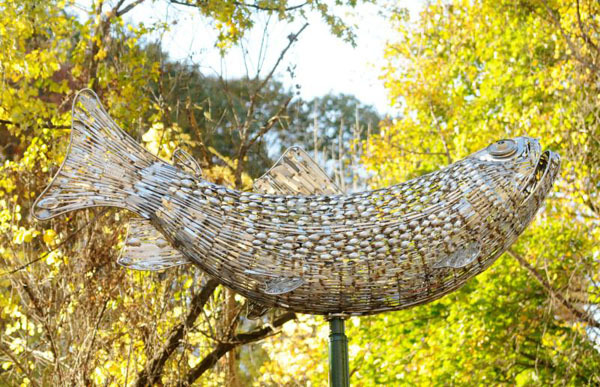 “Brookie ” created by John Sendelbach is a 10-foot-long sculpture made of spoons, forks, knives and other stainless-steel cutlery that is located in Greenfield, Massachusetts. We like to see the recycled use of flatware into art on this blog. Bamboo handle styled cutlery of good quality is very difficult to find. If you want real bamboo handles or plastic then you will get what you pay for. 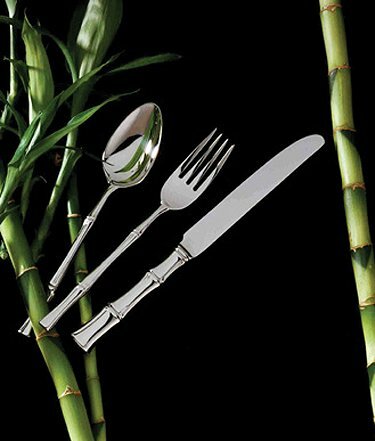 But a good set of flatware in stainless steel with the classic bamboo “look and feel” is hard to come by. This 5-piece bamboo flatware set by Ricci is only service for 1, so you can order how many place settings you need. It includes salad fork, dinner fork, dinner knife, place spoon, and teaspoon. Made of the standard 18/10 stainless steel that is dishwasher safe and doesn’t require polishing. The Halloween season is upon us and this Trick or Treat has seem to gone to the trick side. This cutlery chaos is a prank that seems to be spreading across the United States in the last year. 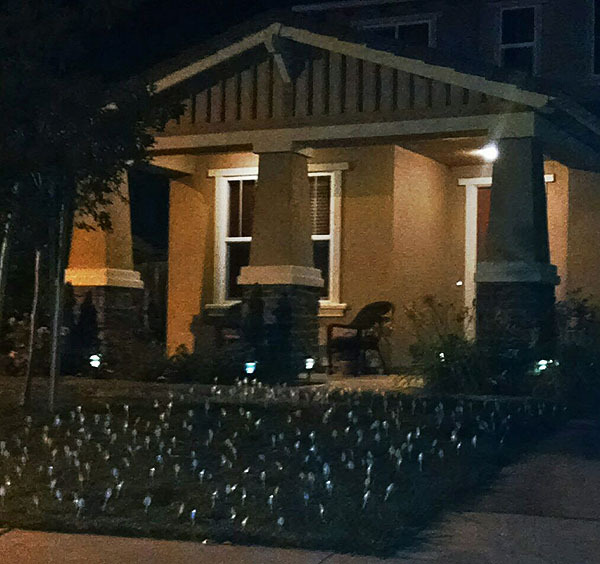 In the photo above (uncredited) there are hundreds of spoons stuck handle first into that poor guy’s lawn. No one seems to be sure of the origin or reasoning for this “Lawn of Spoons” but it has variations such as using forks (Forking) or using plastic flatware and breaking the tops off (which will wreak havoc with the lawnmower). 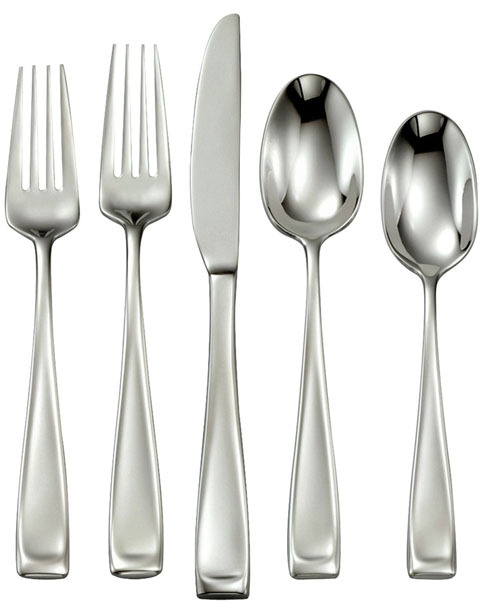 Oneida’s Moda cutlery set has a classic flat bottom to the handle that gives you such a sense of “solid”. It’s a flatware set that feels like it is made to be thrown around and abused, I mean that in the nicest way of course. Made of 18/10 stainless steel the shiny surface holds up to abuse and may occasionally show rust spots if placed next to carbon steel in your dishwasher but a little Coca-Cola or vinegar will clean that up real quick. This 65-piece set consists of 12 teaspoons, 12 table spoons, 12 knives, 12 forks, 12 salad forks, a butter knife, serving spoon, sugar spoon, pierced serving spoon, and a serving fork. This cutlery set is what I would consider a “buy it for life” investment.